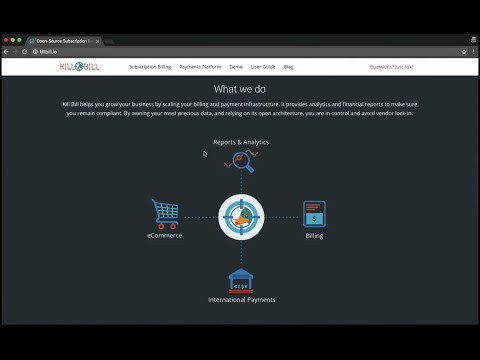 The Billing System relies on the Payment System to make payments but the Payment System also offers direct payment APIs and therefore can also be run as a standalone application. Core services (account management, invoicing, entitlement, dunning, …​) which are built and packaged as independent jars, each of which with its own APIs; those core services post a well defined set of events on the persistent bus which are then consumed by other core services or plugins. Contrary to most billing solutions, Kill Bill is not a batch oriented system, but instead, it is driven by events occurring in the system (for example, the creation of a new subscription will create a new event that the invoicing core service will process and as result a new invoice may be created along with a new event, which the payment core service will then process, …​). Kill Bill is traditionally packaged as a war and is therefore executed within a web container (for example Tomcat). It offers REST APIs to manage the state associated with accounts, subscriptions, invoices, payments, …​ It also provides lower level (Java) APIs and can therefore be embedded as a library within a (Java) user application. Kill Bill Visitors: technical or non-technical folks interested to know more about what Kill Bill is about. Kill Bill Users: technical folks that are interested to evaluate the solution or are ready to deploy it. Kill Bill Developers: technical folks that are interested to contribute to the open-source project (often to enhance the platform to suit their own specific needs). Plugin-specific documentation in the GitHub plugin repository (via a Readme file). An example of such documentation can be seen for the Avatax plugin. For the Kill Bill Developers, we also provide additional pages on our github wiki. Most of our documentation is hosted in a GitHub repository, so please either submit a PR when obvious things are missing or wrong, or let us know so we can improve it! This obviously depends on the type of audience, and also whether you are looking for a Billing System, or a Payment System. Kill Bill supports multi-tenancy, meaning you can run multiple logical instances of Kill Bill with a single server and database. This is the default way to deploy Kill Bill. We posted a blog post which illustrates some of the use cases for running Kill Bill in a multi-tenant fashion. The call above will create the tenant and that tenant will be identified with its own tenantId. The supplied apiKey needs to be unique across all the tenants. The tenantId is immutable but the apiKey and apiSecret can be updated in the event they are compromised. File based configuration (shiro.ini). This is the default configuration embedded in Kill Bill, which provides you with one admin user having all the rights. LDAP: Kill Bill can also interact with a LDAP directory to retrieve the users, roles and permissions. The configuration happens through system properties. Note that all those 3 mechanisms can coexist, and often need to coexist to solve the chicken and egg problem of requiring permissions to add new users, roles, …​ through APIs. The following blog post gives an overview of how our admin UI interacts with Kill Bill and takes advantage of the RBAC features. Ruby plugins. They rely on a built-in framework on top of OSGI to make sure ruby code will be fully isolated. In addition to that, each ruby plugin is based on a Ruby skeleton with automatically generated code which purpose is to allow developers to write pure Ruby code.